Confederate Currency: The Color of Money, is a journey that started six years ago while working as a graphic artist at a blueprint company in Charleston. 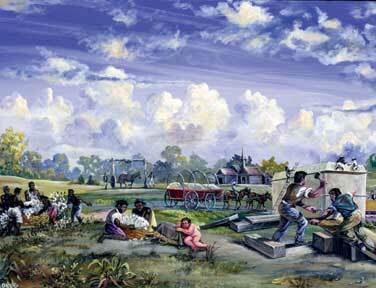 After enlarging a Confederate bank note for a customer, I found myself looking at a picture of slaves picking cotton. Intrigued and excited, I started researching and documenting the use of slaves on Confederate and Southern states money. I was astonished by the widespread use of slaves on these currencies, and even more shocked by the absence of this information in any history books. The engravings on the bills are so small, that unless you were looking for them, you would miss them. I decided to bring these engravings to light, as an addition to my series of paintings of the African American experience. I present the engravings as originally portrayed on the currencies without revision. I have used my colorful acrylics on canvas to bring the paintings back to life, and to extract from the dehumanizing engravings, the essential humanity of their subject matter. When I paint these slave vignettes, I see the strong and indomitable character of the slaves, the will to survive and carry on the qualities they brought with them from Africa in the form of music, religion, storytelling, art, architecture, agriculture, and culinary traditions. The paintings empower the slaves by giving them a voice that asks us not to reflect on them as the objects in the monochrome engravings on the currency, but rather, to join with them to confront the meaning of a system, past in one sense, painfully persistent in others, which enslaved them. I am partial to the narrative content of art. I like to use my art to tell a story. In this collection, the paintings innocuously draw you in and free you up to confront the difficult subject of slavery without the fear of censorship. The juxtaposition of the framed Confederate Currencies with the acrylic paintings inspired by the slave images on the currencies makes a very powerful statement on the contribution of enslaved Africans to the American economy. In these paintings, history informs art, which in turn artfully reveals more history. It has sometimes been said that the history of a country is reflected in its money. That was certainly true in the history of early American paper currencies, and the depiction of enslaved Africans on them. Cotton and slaves were the foundations on which the economy of the South was built. They were important properties proudly displayed on its paper money. Slavery was very important to the South because it was on their money. We can use that little cliché… “It’s right on the money.’’ The engravings are like a visual smoking gun that documents how much free slave labor enriched America. Confederate Currency: The Color of Money tells a story which, though set in 19th Century America, speaks profoundly to the national dialogue today. The exhibition creates a poignant, provocative and illuminating focal point for engaging such issues as slavery, reparations, racial profiling, racial healing, institutional racism and discrimination. Institutions scheduling the exhibition have incorporated it with symposiums, conferences and lectures and have extended it to children and youth through school and community education projects. First Image. 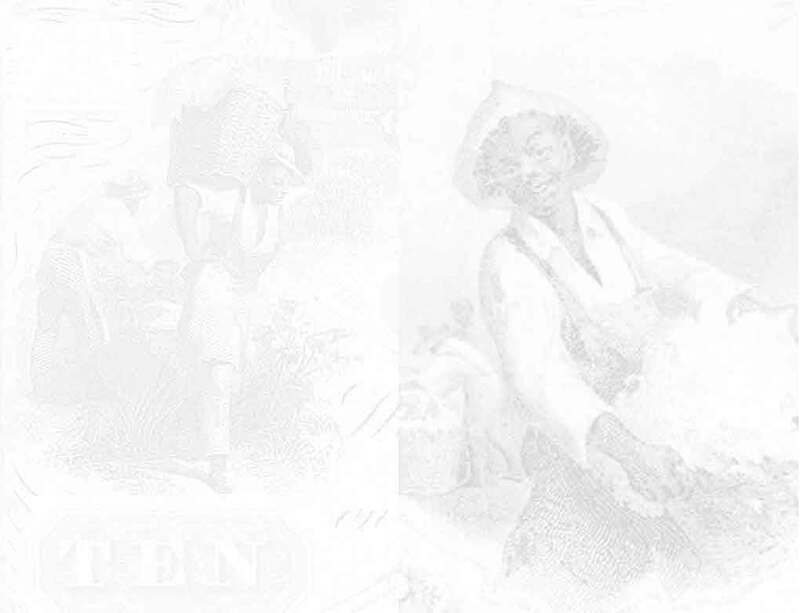 The first depiction of African Americans on any American money was in 1820, with blacks and whites working in a congenial atmosphere engraved on a note from Georgia. 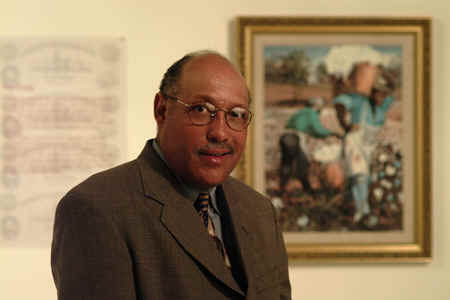 There is no apparent suggestion of subordination, no hint as to African Americans existing as the property of another. For the next 30 years, there were no records of slaves engraved on paper money. But by the 1850’s the country was sharply divided over the slavery issue. The Southern States started putting positive images of slavery engraved on their currency as a way to rebut the movement to abolish slavery.